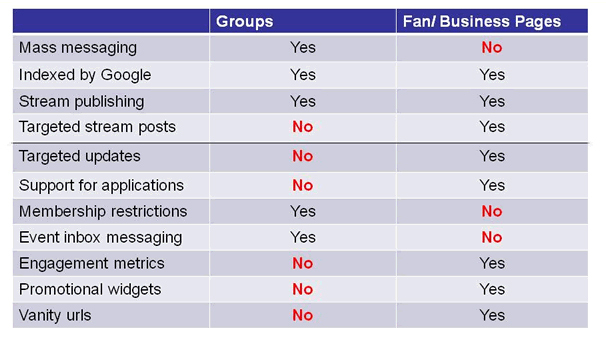 Facebook Pages vs Facebook Groups: Which should you use? This is one of the easier questions to answer, but as with most things, there is no hard and fast rule, it really is a case by case scenario thing. After people tried (and failed) to initially connect with their favourite brands, bands & people, Facebook created Pages i.e. Nike, Coca-Cola, Apple & Lady Gaga all have a ‘Facebook Page’ associated to them; not a ‘Facebook Group’. If you’re an administrator of a Page, then, when you make posts, they are done on behalf of the brand i.e. Coca-Cola posted – "Let's catch up over a coke." Pages are indexed by external search engines i.e. Google, as per a public Facebook profile while Groups on the other hand, are not. Access to a Page, can only be restricted by certain demographics such as age, location, etc. Groups work a little different, let start with an example here; I recently created a Facebook Group for high-school alumni 'Class of ____' . If I, or any of the administrators make a post, unlike the Facebook Page, the post comes from the administrator's personal profile, directly connecting the Group to the person. Groups are considered to be an extension of your personal actions on Facebook. Groups also offer more control with the levels of participation. Administrators of a Group can restrict access, so that new members must be approved, even make it an invite only so it’s more of a private club. Due to certain size limitations, only Groups <5K members can send mass emails to all members, which can be a very handy contact point. Basically, you can (to a degree) anonymously manage a Page but not a Group. Pages allow you to act as a corporate entity, where as a Group does not. IF YOU ARE A CORPORATE LIKELY YOU NEED A FACEBOOK PAGE. IF YOU ARE LOOKING FOR A PRIVATE SILOED CLUB, LIKELY YOU NEED A FACEBOOK GROUP.